The nearest police station is in Abingdon at the junction of Colwell Drive and the Marcham Road, opposite Macdonalds and close to the A34. The telephone number is 01235 556850. 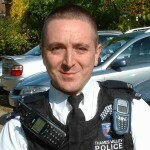 Our Area Beat Officer is PC Jeff Wheble (Shoulder No 1225). He can be contacted on the above number or 0845 8 505 505, which is the Thames Valley Police non-emergency contact number. Jeff holds regular monthly ‘surgeries’ at the Village Hall on Saturday mornings between 12.15 and 13.15. Jeff’s latest report/ advice to the village is“Hello! I hope you are all looking forward to the festive season and the good things that make this time of year so special. However, as you are all aware, there are those to whom the weeks before Christmas represent a great opportunity to wreck other people’s festivities by burgling their homes and stealing the things they have bought. Some simple measures can drastically reduce the risk of your home being targeted. For instance, please ensure that you don’t wrap up presents too early and leave them lying around where they can be seen from outside. I know it sounds obvious but many break-ins at this time of year happen because of this very reason. Also, make sure you keep the receipts for any presents you have purchased in a safe place; a favourite tactic for a burglar is to find the receipts for such items and take them with the stolen gift back to the shop for a refund! Finally, make sure that you don’t leave boxes, particularly ones that once contained an expensive television or hi-fi out with the rubbish in full view after Christmas is over. This is another way for criminals to target your property. These are common sense precautions that will go a long way to making sure you have a great Christmas. On a positive note, Radley really does have one of the lowest crime rates in Southern Oxfordshire and is a very safe place to live. For those of you who have yet to meet me and would like to discuss any issues, I run a monthly surgery at Radley Village Hall for an hour on Saturdays starting 12.15pm. The next one is scheduled for 29th January 2005 and I really would like to see you there, as the last two have been a little lonely! I hope that you will see me a lot more round the village in the New Year as it is my firm belief that the best community policing is done on foot patrol, so please stop me for a chat. It only remains for me to wish you all a very Happy Christmas and a healthy prosperous New Year.